New Zealand has so much to offer including snorkeling with the dolphins in Kaikoura on the South Island. Encounter Kaikoura offers tours that give you an option of watching, swimming or snorkeling with the Dusky Dolphins off the South Coast of New Zealand. Encounter Kaikoura has been operating since November of 1989 and over the years have acquired a great understanding of these incredible mammals in their natural environment. 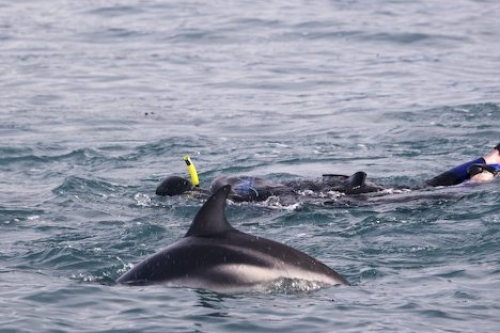 To be able to go snorkeling with the Dusky Dolphins off the Kaikoura Coast is a very special experience in one's life. It makes one aware of the true miracles that reside in our oceans and how harmless these mammals can be. The Dusky Dolphins are seen off the Kaikoura Coast of New Zealand all year and snorkeling is possible on any given day depending on the weather. Visitors who feel safer aboard the vessel can watch these fascinating mammals and actually see the closeness of the dolphins and their reaction to the people. If you want to have the pleasure of snorkeling with the dolphins on Encounter Kaikoura be sure to book ahead when on the South Island of New Zealand as these trips fill up fast. All snorkeling equipment is supplied on board and it is best if you have some knowledge of snorkeling as the open ocean off Kaikoura can have a mind of its own. Snorkellers with Dusky Dolphins during a dolphin watching and swim with the dolphins tour with Encounter Kaikoura, Kaikoura, East Coast, South Island, New Zealand.